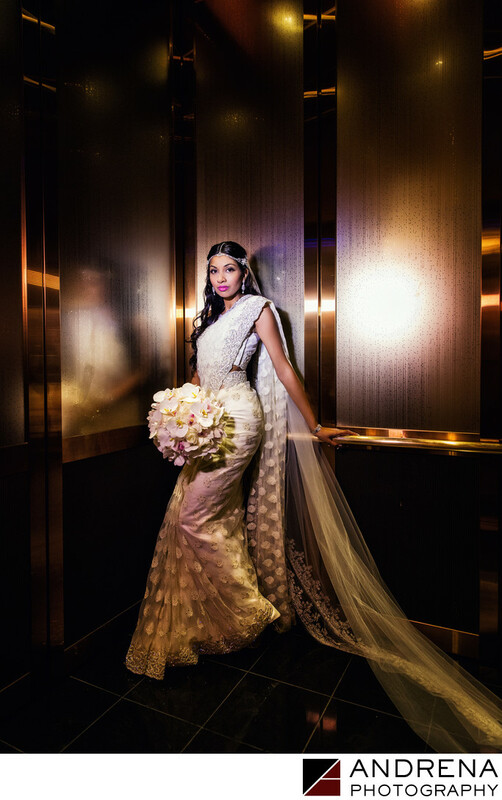 The elevator at the Ritz Carlton Marina del Rey provided the perfect backdrop for this stunning wedding portrait of a Sri Lankan bride. To create this portrait, I positioned the bride in the corner and used off-camera lighting to create drama and dimension. The use of off-camera lighting in weddings enables photographers to make their work look more interesting. Creative Photoshop work helped bring out unique colors in this metal, and also helped enhance the overall depth of the image. This was a working elevator, so we had to work really quickly to create this image. The elevator started beeping at us immediately, but I was able to coax the bride into giving me just the right expression of attitude, creating a winning image. This Sri Lankan wedding was featured on Maharani Weddings.